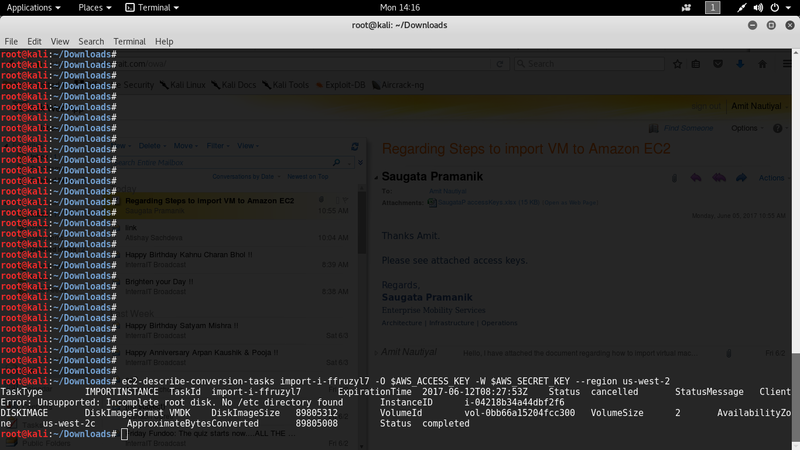 This was the error that I received while creating an instance of an OPENBSD vmdk file to AWS using EC2 API tools. I tried using Ubuntu,Kali Linux but the same error persisted. AWS does not support creation of OpenBSD instance using Windows platform. First of all, I presumed that this error is due to a corrupt vmdk , so I re-downloaded it but it didn't help. There is not much information on the Internet about how to create an instance of OpenBSD on AWS. Client errors.are usually caused by something the client did, such as specifying an incorrect or invalid parameter in the request, or using an action or resource on behalf of a user that doesn't have permission to use the action or resource. These errors are accompanied by a 400-series HTTP response code. This is the command i use "ec2-import-instance openBsd.vmdk -f VMDK -t t2.micro -a i386 -b import-export- o $AWS_ACCESS_KEY -w $AWS_SECRET_KEY --region us-west-2"